GSD history, relatively speaking, when compared to many of the other available breeds of dog of today, is still that of a very young dog breed. Captain Max von Stephanitz, a German cavalry officer, developed the German Shepherd Dog breed in 1899, based entirely on his vision of the perfect working dog - one type of dog which could work equally well under any conditions. He saw no beauty in a non-functional dog and was ruthless in discarding what he considered weak. Tireless and determined, he laid the foundations of the GSD anatomy that were later to make the breed the greatest all-round working dog in the world. German Shepherd Dog history began in just this way. 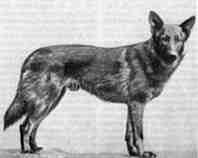 Using a variety of German sheep dogs as his foundation stock, Max von Stephanitz developed a new and distinctive working dog breed, the German Shepherd dog. He greatly admired the herding dogs of his native Germany, and believed they had the full potential to be the total all-purpose working dog. Max von Stephanitz was very aware of the historically declining need for herding dogs and believed that the working abilities of the breed would decline unless they were put to other uses. An idealist with both strong intellect and the financial capabilities to support his ideas, Max von Stephanitz also possessed the determination, drive, and dedication to put his ideas into practice. His perception of a herding dog was of an extremely intelligent, vigorous dog, of stable character and with many of the physical attributes belonging to the wild dog- fleet of foot, long of wind, and untouched by the extremes of other breeds. He was well on his way to beginning the GSD history. Until Horand, herding dogs came in a variety of shapes, sizes, types and abilities. Shepherds in Germany like elsewhere in the world, chose their dogs for their fitness, mental and physical, and for work only, and cared little for the dogs appearance. 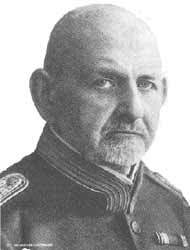 Max von Stephanitz had very positive ideas about the mental, anatomical, and bio-mechanical characteristics required of a herding dog. He had a great understanding of the mental and anatomical requirements of a working shepherd dog. Very possibly by chance, the beginning of the GSD history started at a dog show in Germany. While at the dog show, a medium-sized yellow-and-gray wolflike dog caught the attention of von Stephanitz, attending the show with his friend Artur Meyer. This dog, Hektor Linksrheim, was immediately purchased by von Stephanitz and renamed Horand von Grafrath. Horand became the first registered German Shepherd Dog, with the number SV1. Only weeks later von Stephanitz and his friend Artur Meyer founded the Verein für Deutsche Schaferhunde, or SV (German Shepherd Dog Club), along with the help of a few other co-founders. The dog club, the Verein für Deutsche Schäferhunde (SV), was to become the largest and most powerful dog breed club in the world and a major step in GSD history. A standard for the GSD breed was soon developed based on mental stability and utility. The captain's motto was "Utility and intelligence". To him beauty was secondary, and considered a dog worthless if it lacked the intelligence, temperament, and structural efficiency that would make it a good servant of man. The German Shepherd Dog breed standard was developed as a blueprint listing the exact function and relationship of every aspect of structure, gait, and inherent attitude, combined with a comprehensive breeding regulation, which required that dogs used for breeding had first to prove their worth physically and mentally. Later, using the co-operation of local police and working dog clubs, a set of specific dog tests were developed in tracking, formal obedience, and protection work. This developed into present day Schutzhund dog trials - another important part of the GSD history. The authorities were persuaded to utilize the German Shepherd Dog in many branches of government service and served during the war as supply carriers, sentinels, Red Cross dogs, messenger dogs, tracking and guard dogs, to name a few. The German Shepherd Dog, historically speaking, was just gaining notice in the United States when World War I broke out. In 1917, when America entered World War I, all things German became tabu. The AKC changed the name of this dog breed to the Shepherd Dog and the German Shepherd Dog Club of America became the Shepherd Dog Club of America. In England, the name of the German Shepherd Dog breed was changed to the Alsatian. After WWI, British and American soldiers, impressed by the abilities of the German Shepherd Dog, brought home examples of their own to breed. The dog breed instantly become popular, both as a family pet and as a working dog. After the war the movie stars Rin-Tin-Tin and Strongheart stimulated interest in the GSD history and dog breed again. The striking good looks of this breed, combined with its remarkable intelligence and loyalty, have made it a favorite working and companion dog. Puppy factories soon flourished to meet the huge demand, flooding the American market with poor quality "German police dogs", resulting in a down-turn in popularity of the breed. Later during World War II, the German Shepherd Dog was widely sought after and employed by both Allied and Axis forces. These dogs performed various duties such as mine detectors, sentinels, guard work, and messengers. In America, Dogs for Defense was formed, providing thousands of dogs to the army. In German Shepherd history the paths of German and American German Shepherds diverged after World War II. Many German Shepherd Dogs had been killed or destroyed due to lack of food. Later on the breeders again had individual dogs dominant in the desired virtues of the breed. By about 1949 quality GSD specimens again began to appear at German dog shows. In the 1950's American breeders recognized the need for some infusion of outcross blood and Troll von Richterback, 1957 Grand Victor, was dominant in his day. In the 1960's there was an emergence of several strong families of stud dogs. This was an important part in rebuilding the GSD historically speaking. While the SV was in control of German bred German Shepherds, American German Shepherd breeders were open to follow their own preferences. American and Canadian Grand Victor, Lance of Fran-Jo, represented a new era in American shepherds and was widely used during the 1960's. Lance produced many GSD puppies which in turn became historical pillars of the breed in America. In Germany, GSD history reveals that a very active market soon developed for German Shepherd Dogs and puppies sought in countries such as South America, Japan, Italy, many Scandinavian countries, and France. Additionally, the SV began to place more and more importance on dog training degrees. Temperament and courage tests became much more demanding, and the SV forced breeders to concentrate on puppy and dog problem areas such as missing teeth, poor croups, etc. 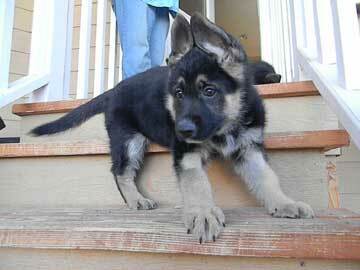 Starting with a common base, the German Shepherd breed in Germany and America have taken a separate course. The Americans and the Germans have both evolved closely-bred dogs. They differ in looks, movement, style, and structure and have developed both desirable and undesirable characteristics into the breed. The Americans have a broader option to pursue their own views and choose their own bloodlines whether from within or outside their own country. The Germans, controlled by the SV, will likely continue to look within themselves to further develop the breed. Today the German Shepherd Dog is still considered one of the most intelligent and versatile breeds in existence and the future will indeed be very interesting for the breed. Indeed, the GSD history has been nothing short of intense so far. And if you would like to read a few German Shepherd Quotes , then here you go - enjoy!